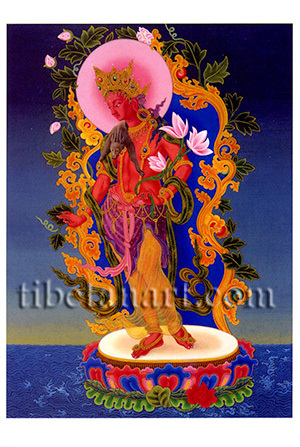 This exquisite painting depicts Avalokiteshvara (Tib: Chenrezig), the bodhisattva of compassion, in the form of Red Padmapani, the 'Holder of the Lotus'. He stands gracefully upon a moon disc and a multicoloured lotus that arises from a lake. He wears the eight jewel ornaments and five silk garments, with a lower robe made from diaphanous silk. An antelope-skin is draped across his right shoulder, and his aura is fashioned of ornate golden scrolls, which are embellished with leaves and lotus buds. His right hand is held downwards in the abhaya-mudra of giving refuge or protection, and his left hand holds the stem of a triple-flowered white lotus, which symbolizes the Buddhas of the three times; past, present and future.